So you may think I’m a couple of days late in posting this, but you’d be wrong (wrong, I say!) because I just pushed some fresh changes to Protagonize yesterday that you should all find useful. Assuming you have permission to do so. 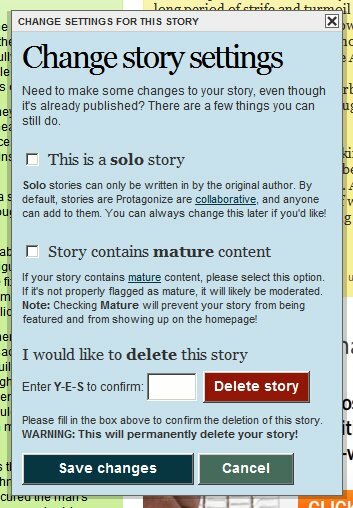 As I posted about earlier this week, you can toggle solo mode on the story in question, provided you’re the only author in the story to-date. The new addition from yesterday is the option to delete your story. Why on earth would you want to do this, you ask? Well, if you posted something that’s not quite ready for prime-time, or you feel that you have an old post that no one’s looked at that you’d like to remove, or any other reason, you can now delete entire stories provided you are the only author participating in the story. Yes, this means that if you wrote 10 chapters all by your lonesome, you can still drop that story like a bad habit if you so choose. Just keep in mind that deletion is permanent, so I can’t retrieve the story for you if you once it’s gone. There’s couple of confirmations you’ll need to go through, just to make sure you don’t accidentally delete anything you didn’t mean to. And you can’t delete a story anyone else has collaborated on with you, either. 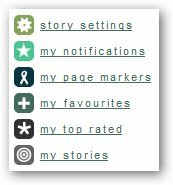 This should (again) reduce the amount of reports I have to deal with. More power to the people! Hope you guys find this new addition useful. I’m still chugging away on a variety of things for the site and I think you’ll really enjoy all the stuff I have lined up for Protagonize in the coming six weeks before Christmas! This entry was posted in Features, Site mechanics, Site updates, Tutorials & Walkthroughs and tagged deleting, Features, howto, mature flag, solo stories, story settings, tutorial. Bookmark the permalink. Awesome changes, especially the changing of mature and deletion bits!